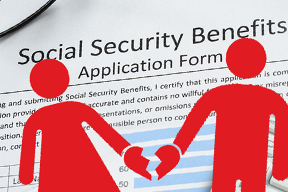 Am I Eligible to Receive My Ex-Spouse’s Social Security Benefits? Divorce is a new experience for most couples—unless you’ve been married and divorced before, you probably have a lot of questions, and many of them have to do with finances. Typically, those financial issues center around alimony and child support (if you have minor children). Increasingly, however, divorcing couples wonder if they’re eligible to receive Social Security benefits on their ex-spouses’ record. Who Is Eligible to Receive an Ex-Spouse’s Social Security Benefits? If you meet all these conditions, you are eligible to receive one-half of your ex-spouse’s full retirement amount (or disability benefit) if you begin to receive these benefits at your full retirement age. If you remarry, you can collect this benefit if your later marriage ends, either through death or divorce. If your ex-spouse has not applied for his or her retirement benefits, you can still qualify for them as long as you have been divorced for at least 2 years. What If I Continue Working? If you continue to work while receiving any of these benefits, you will be subject to the retirement benefit earnings limit. If, for example, you haven’t reached full retirement age, you can make up to $16,920—for every $2 you make over that amount, Social Security will deduct $1 from your benefit payments. In the year you reach full retirement, Social Security will deduct $1 for every $3 you earn over the limit of $44,880. The laws which relate to divorce can be complicated and differ from one state to another. If you are contemplating divorce—or already going through one—contact our family law attorneys, Jonathan Z. Petro, Esq. and Danielle A. Rosiejka, Esq. can help answer your questions, navigate you through the process and protect your rights.